A few days ago, Scott asked for the address to my blog. I was immediately suspicious. He told his friend that I had a "cooking blog". The friend was going to give the URL to his wife so she could look at it since she likes to cook too. I hung my head in shame. I said he should probably not do that. There wasn't much to read in the way of "cooking" lately and he's all confused and I'm all, "I mean, I have a recipe index…" and he's like, "Hey, just give me the link to that then" and I scowled and that was the end of the conversation. Side note: Let me remind you all that I have the recipe index simply because I'm terrible at writing down recipes. I even try, every now and then, to do this in a word document and I fail at that. The only way a recipe ever gets documented in this house is if I click "publish". The next day, I made soup from scratch. Often, French Onion soup is one of those that tempt me on a menu when I'm out somewhere. However, having worked at a restaurant, I know that they just reheat that same pot of soup day in and day out until it's gone. Really. Never order soup in a restaurant. So I make my own French Onion soup at home. Usually I use the crockpot, but sometimes I just don’t feel like cleaning the crockpot. That is the honest to goodness truth. Sometimes using it is actually more trouble than it’s worth. It often sits in the sink for days, full of soapy water, after it has crockpotted us a delicious soup or stew. This time, I went with a stockpot on the stove. I caramelized the onions first and it only took about 30 minutes. I filled the pot with beef stock and let it simmer all day. This might be the easiest soup in the world. The caramelizing will take about 30 minutes. Then, add in the wine, garlic salt, and Worcestershire sauce and turn it up to medium. Pour in the broth or stock. Allow it to come to a boil and then turn it to low and keep the lid on. It can simmer for an hour or 6 hours. Whatever fits your timetable. The longer it sits on low heat, the better. To make croutons, this is my preferred method with swiss, provolone, mozzarella, etc. However, if that's too involved (as it was for me on this particular day…), just slice some crusty bread, broil it to golden-brown, and add cheese to the top. hahaha--I had to laugh at you getting suspicious about him asking for your blog address! I've only had french onion soup once in my life, this year, at my grandma's house...I could see how it would be addicting! 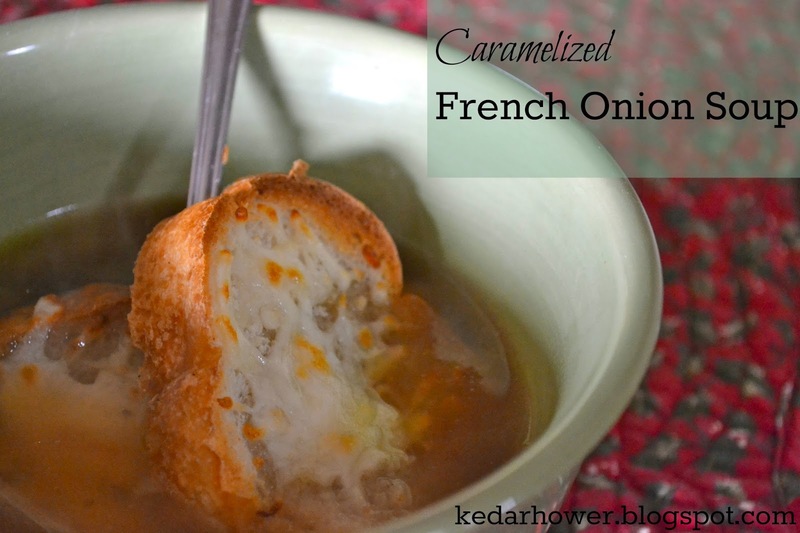 I haven't had french onion soup in so long, but I just might have to try this recipe! I just got a crockpot and am still in the honeymoon stage with it haha so I might try this recipe using that! I LOVE french onion soup. So does my husband. He keeps saying we need to get those special bowls they come in. And now I will never eat soup anywhere except my house. Because ew. One of my absolute favorites! I actually just gave away my crocks because I don't make it often enough, but I do love to make it. I am in the process of going through old/family recipes to make and put on the blog in 2015 because that's the only way I am keeping them well. you know, i have never had french onion soup.. sounds delish! Yum, this looks fantastic!!! I use my recipe index the same way, well, Mike does. He occasionally says he's cooking dinner, grabs my iPad and finds something he likes on my blog. I've never had French onion soup. I probably never will...Isaiah utterly hates onions so I literally never use them in a single thing I cook. Once in a while I can get away with putting leeks in something, but only if I hide it well. I just had French Onion Soup from Panera today for lunch. But homemade would be so much better! Will be making this soon! One of my favorite things to make! kev used to never read my blog, but then when he deployed, it made his feel connected to our daily lives. Now he gives me a hard time if I don't post!